I made Tarte Tatin for guests the other day, and it was probably my most successful effort to date. 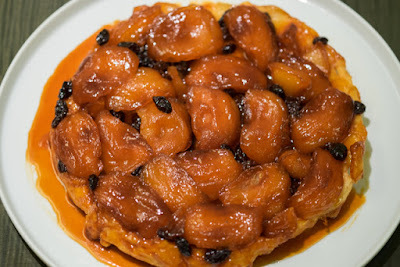 I used the official version from the Confrerie des Lichonneux de Tarte Tatin for a classic beginning (see my post of January 16, 2016 for the recipe and illustrations). Just before covering with the puff pastry crust, I added raisins soaked in orange flower water, an idea found in Paula Wolfert's excellent The Food of Morocco. Ms Wolfert states that she tried in the book to avoid "nouvelle cuisine Morocaine" but could not resist the combination of Moroccan tastes with a French classic. And it worked! 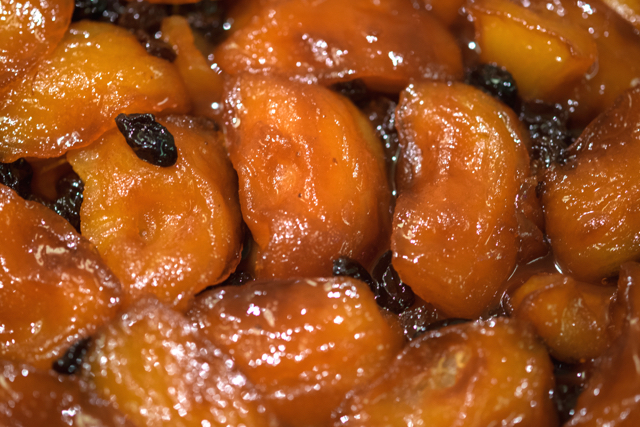 The orange flower water, raisins and buttery caramelized apples were a perfect combination. Not easy, but then not impossible either, as you can see from the recipe, and a stunner every time.